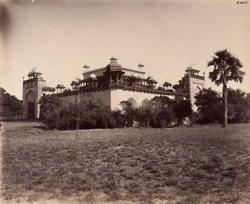 Photograph of the Mughal Emperor Akbar's Tomb at Sikandra in Uttar Pradesh, taken by Edmund William Smith in 1893-4, from the Archaeological Survey of India. General view of tomb from the south-west. The village of Sikandra was named after Sikander Lodi (1489-1517) the king who established his court at nearby Agra in 1504. Mughal Emperor Akbar (r.1556-1605) was an energetic and innovative ruler who succeeded in being a significant unifying force in India. His syncretism was reflected in the architecture built during his reign, including his tomb which blends Persian and Hindu elements. Dated inscriptions show that it completed by Akbar's son Jahangir in 1614. It is set in a vast square garden of the char-bagh (four-plot) plan, divided into quarters by red sandstone causeways containing water channels, interspersed with fountains and ponds. The ground-level storey comprises a set of arched recesses with a tall rectangular central gateway topped by a marble kiosk. The cenotaph sits on the top, fifth storey which is open to the sky, exactly above the grave in the chamber below.It is inscribed with the ninety-nine names of Allah and intricate floral motifs.